Ergo Universal Slicker (Blue) brushes for getting rid of unwanted hair and tackling those small areas of matted or tangled hair. I bought this for my labrador and find it very effective and more comfortable to use (I have a slightly arthritic hand) than my previous dog's slicker brush. 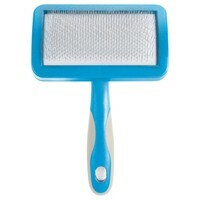 My dog will stand happily for his grooming with this, so obviously it cannot be scratching or irritating him. To remove maximum loose hair, use it first against the lay of the coat, then in the 'right' direction.